HTML5 Security - Why should I care? HTML5 offers clear benefits in terms of easier development and consistency across web browsers, allowing developers to provide a richer internet experience. However, as with any new advancement it also introduces new opportunities for cyber hackers. Therefore it is critical that developers understand the security implications of using HTML5 and how to identify and remediate potential vulnerabilities resulting from its use. In this webinar we’ll discuss the security considerations when using HTML5 and offer advice for minimizing application vulnerabilities during the coding process. We'll also describe how HP Fortify's Software Security Assurance (SSA) tools can be used as part of a secure development process to deliver the benefits of HTML5 without the risks. 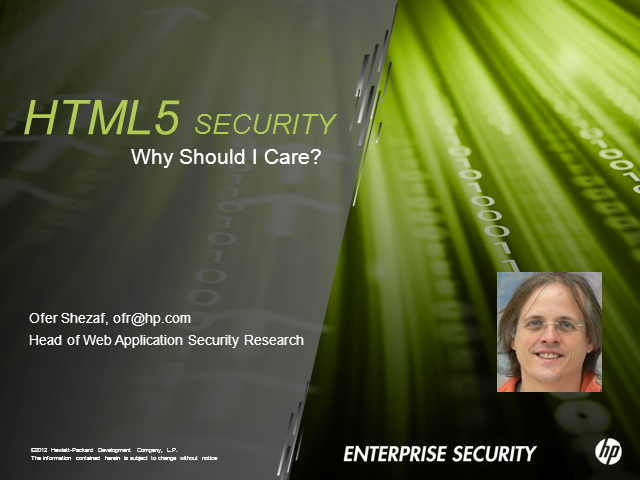 Title: HTML5 Security - Why should I care?